These mitts are nice paired with the Men and Women's Beanie. 4. 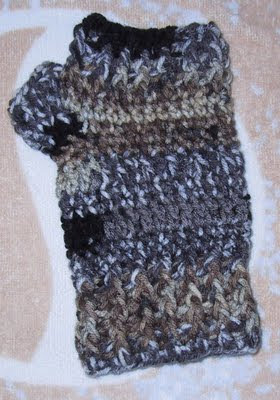 The mitt pictured was crocheted using I Love That Yarn. Foundation chain: With I hook, ch 28 , join with slip stitch in first chain. I'd definitively be doing these for my friends! thnx for sharing! I am going to try these tonight. I need just a little something extra on these blustery days when I go outside to take care of my chicken chores. This will be just the ticket.